"Nova Systems tastes the future". Nova Systems has used the rhetorical device of the human senses in order to describe its strong points. Innovation is one of them. Our senses are our windows on the world. And our firm is increasingly present in the world thanks to the software solution distributed through cloud computing, the new frontier for business management. Nova Systems has been one of the forerunners in this area in Italy. "Our society has been distributing its services through cloud computing for over 14 years and has more than 30 years experience in the specific sector of international forwarding, transport, logistics, and customs. This is reflected in our management applications, the components of which have been realized paying the greatest attention to the needs of the workers in the sector" says Riccardo Tarocco, the Chief Software Architect. The BeOne Cloud Forwarding Suite is a software solution devised by Nova Systems' development center; it has many application potentials which are downloadable and independent of the society. "The Software Services and Management System is distributed through Cloud computing; it is quite secure and full assistance is available 24/24, 7/7, 365 days a year", says Tarocco. "A business that has decided to substitute an in-house software solution for one using Cloud can obtain a great reduction of costs". BeOne exploits the latest technologies on the market and integrates them to make them compatible with the latest versions in order to constantly improve on previous versions. Already in 1989 Nova Systems adopted as a development tool the Computer-Aided Software Engineering (Case) solution, which was used to create the STS product, in other words the second generation of ERP software for the sector of forwarding and logistics. "In 2005, once again looking ahead, for our software development we adopted Object Oriented Programming (OOP) and Architected Rapid Application Development (ARAD) which allowed us to free ourselves from generation platforms, whether current or future, at a users interface level, an Application Server level, and at a Database Management System (DBMS) level. From this Nova Systems developed a third generation of ERP software, the BeOne Cloud Forwarding Suite", Tarocco adds. The user of BeOne can manage any kind of operation thus making management far more simple and immediately useful. Thanks to this approach the user does not have to learn how to use other applications. "This is one of the great differences between BeOne and other solutions on the market", Taroco states. "It often happens that firms use different software within their own management applications, which are difficult to integrate with each other. In such a case the user must learn different procedures with a consequent loss of time and money. This is far more complicated than access to a single suite that accompanies the users in all their activities". Nova Systems' peculiarity is that it offer IT solutions by managing the whole applicative part in Cloud computing (Software as a Service, SaaS). This means that, whatever happens, the customer has a single interlocutor, Nova Systems, and this guarantees highly efficient and rapid intervention. 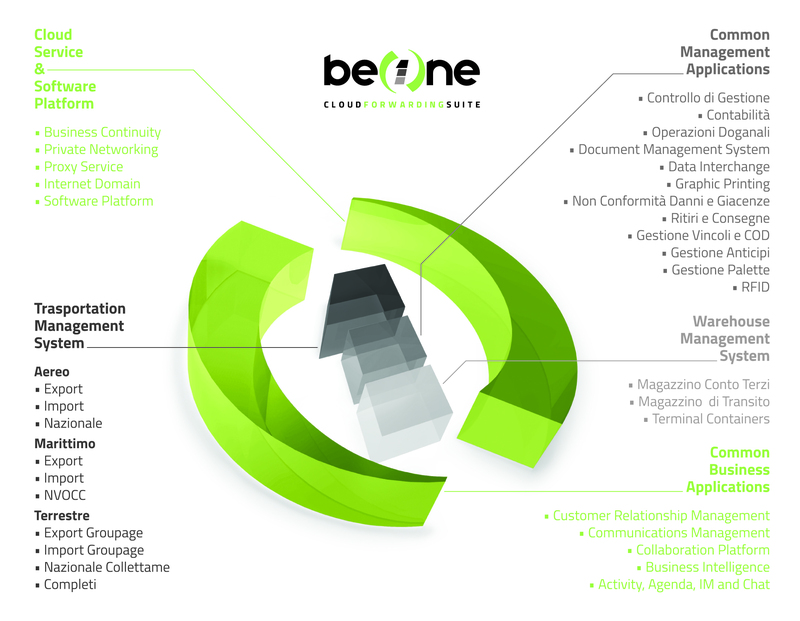 The BeOne Cloud Forwarding Suite consists of 42 modules which are completely integrated with each other; each of them has a specific function and adapts to the needs of the clients who, when they need new functions, can activate the modules in the precise moment of need. "Another great advantage deriving from the pay-to-use model is the freedom of clients to increase or lessen their use of the software, for example on the basis of periodicity and the firm's needs. On-promise solutions, instead, license upgrading but not downgrading. The result is that businesses have greater costs in relation to the effective use". BeOne has over 2,400 parameters which can influence the functioning, the controls, and automatism. This approach allows adaption to the needs of the customers, according to their organization, the flow of work, and the complexity of the individual firms. With Nova Systems software it is possible to have the same result starting from different ways of managing business processes. "Another aspect to which we pay particular attention is software performance because it directly influences user experience. To have a better performing product increases productivity", Tarocco notes. "BeOne is a user friendly product: the preferences of individual users are memorized and suggested again on further use without forcing the user to undertake the same operations each time". The user's interface, which is standard for each BeOne module, allows the use of a more intuitive software, thus simplifying the learning curve of the product itself. "We have inserted into a software, to make it more easily useful, a BeOne Activity Management module which averts the user to events that result from actions outside or inside the business. Very recently Nova Systems has created some new BeOne functions, above all the Verifica Fattura Fornitori module (the module for checking suppliers' invoices). This allows both manually managing the checking, or the EDI reception, of invoices by the supplier. "This module has an 'in memory' function which allows you to navigate data in real time without delay, thus greatly speeding up verification", Tarocco states. We are also about to implement the BeOne Sea Sync module which will allow the possibility of automatically bringing up to date the tariffs of maritime companies; we have also already released, as part of the suite, the BeOne Air Sync relative to the tariffs of airline companies. In the forthcoming year, says Tarocco, "there will be further innovations concerning the BeOne platform, in particular the Collaboration Platform. These will be announced soon".